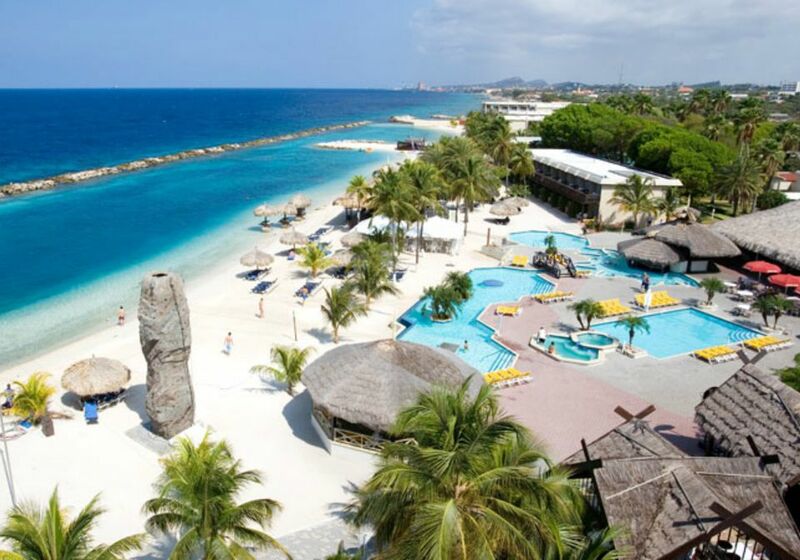 As one of a few all-inclusive resorts on Curaçao, the Sunscape Curaçao is a top pick for families. It offers a convenient beachfront location near Willemstad, just a short shuttle ride from restaurants and shopping. The 341-room property is in the moderate price range and offers a laid-back vibe and many kid-friendly activities for kids and teens, including water sports such as snorkeling and kayaking; movie nights; games such as volleyball, shuffleboard, Ping-Pong, and soccer; a small playground; and a climbing wall. There is also a supervised kids' club for children ages 5 to 12. The resort's relaunch upgraded this property to four stars but families should be aware that this is not a luxury property. Many rooms have been updated with a colorful, fresh decor. Many rooms have ocean views. Be aware that some buildings still have older decor and require an update; consider requesting a room in a renovated building with a view. The resort has a good-sized beach in a jetty-protected area, which makes for great swimming and snorkeling. There can be a lot of coral and rocks at the shoreline, so you may want to pack water shoes. There are three pool areas plus hot tubs. The pools are basic, without water features such as water slides or water jets. There are five a la restaurants at the resort but no reservation system. Guests are seated on a first-come, first-served basis. You are given a pager that lets you know when your table is ready, so consider sending one family member down to put your name on the list so that you are not waiting too long. The beach and pool areas can get very crowded. Be aware that nighttime entertainment in the pool/beach area can mean oceanview rooms are not quiet at night. Ask for a room away from the noise if that is important to you. Wi-fi access is free in the hotel lobby but not complimentary in guest rooms. Expect to pay $10 extra per day or $30 for a week. Though just six miles wide and 37 miles long, Curaçao is the largest of the Lesser Antilles islands and the most populous. The island offers dozens of beaches, first-rate diving, and picturesque towns full of colonial Dutch architecture. As one of the so-called Dutch A-B-C islands (along with Aruba and Bonaire), Curaçao is one of the few Caribbean islands that lies outside the hurricane belt. Located in the Southern Caribbean a few miles off the coast of Venezuela and more than 500 miles from the Lesser Antilles chain, the three islands in the Netherlands Antilles are far from the hurricane belt. While glancing tropical storms have occasionally done some damage to these islands, the last major hurricane to make a direct hit on the ABCs was in 1877. The island also offers plenty of fun for families, from exploring beaches and underground caves to visiting an ostrich farm or the Caribbean's largest aquarium. Airlines that offer direct flights from the United States to Hato International Airport (CUR) on Curaçao include American Airlines and JetBlue.